Maidstone’s Tom Weeden won one of the closest finishes in Manx Grand Prix history, clinching the Full Factory Winnerswear Senior Manx Grand Prix by less than a second from Andrew Dudgeon after 150 miles of racing around the Mountain Course, adding his name to the illustrious list of previous winners that includes Harold Daniel, Doug Pirie, Geoff Duke, Phil Read, Nick Jefferies and Ryan Farquhar. Weeden clinched the race win with a last lap of 121.109, the fastest of the race, clawing back a nine second deficit over second placed Dudgeon at Glen Helen to take the chequered flag. Former Senior MGP Race winner Tom Dickie was on the start line as guest of honour of the Manx Motorcycle Club, 50 years after he won the race for the last race of the 2016 IMGold Manx Grand Prix meeting. After a delay of an hour and a half to allow the roads to dry after the overnight rain, the race got underway at 11.45 with Ramsey’s Dudgeon, riding the Team Slick Performance Racing Suzuki, first away followed by New Zealand’s Michael Moulai, the 2014 Senior MGP runner up, on Team Collins & Russell’s Kawasaki. 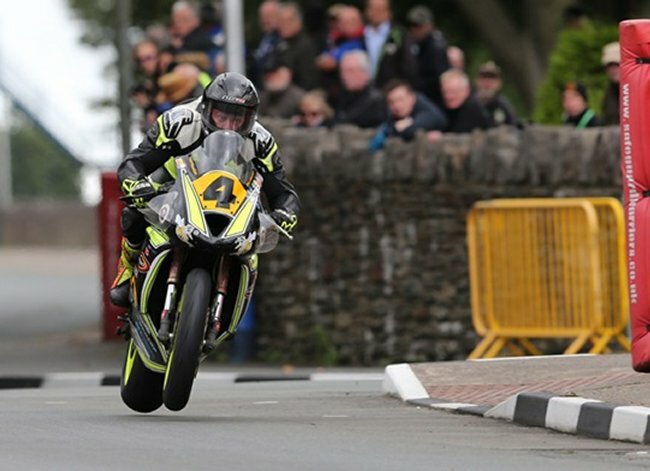 The Isle of Man’s Michael Evans, Monday’s Newcomer A Race winner and the fastest qualifier for the race, was third away from the start line on Glencrutchery Road with Maidstone’s Tom Weeden, riding a Triumph, the fourth rider to leave the line. Dudgeon was first to Glen Helen on the road but Tom Weeden was just over 2 seconds up on Dudgeon at the first timing point. Joe Ackroyd, who was reported to have some issues on the start line, had clearly resolved them as he slotted into second place at Glen Helen, half a second behind Weeden from a starting position of 17th. Michael Evans was well placed in fourth, just over a second behind Dudgeon, and was leading the ‘Evans’ battle from Barry Lee and Gareth in 5th and 6th respectively. Dudgeon was on the charge and had cut the deficit to less than half a second to race leader Weeden by Ramsey with Joe Ackroyd almost 1.5 seconds back in third. Richard Wilson, from Lancashire, moved up to fourth to challenge the leaders with Gareth Evans moving into fifth, eleven seconds behind the leader. With lap times noticeably slower over the mountain section, with riders responding to the lack of adhesion flags, new race leader Dudgeon was first across the line on the opening lap with 118.960 a second ahead of Weeden (118.847) with Ackroyd (117.953) completing the top three. Wilson’s 117.416 kept him in fourth ahead of Barry Lee Evans (117.071). The leading pair Dudgeon and Weeden were clearly stretching away from the chasing pack with the former moving two seconds ahead of Weeden by Glen Helen on the second lap and the latter now over eight seconds in front of third placed man Ackroyd. Coming into the pits at the end of the second lap Dudgeon’s 119.577(18.55.905) gave him a lead over almost eight seconds over Weeden 118.866/ 19.02.703) with Ackroyd’s second lap of 118.803/ 19:03.304 consolidating third almost ten seconds back. The euphoria of race wins for Michael Evans and Jamie Hodson on Monday and Wednesday was reduced when the pair were forced to retire in the pits at the end of the second lap but at the front of the field Dudgeon gained almost two seconds on Weeden in the pits and extended his lead to over nine seconds by Glen Helen on the third lap. Dudgeon maintained the nine second gap from second placed Weeden with a third lap of 115.066 to Weeden’s 114.947 with Ackroyd well set in third place, 21 seconds back on the leading pair but 22 seconds ahead of fourth placed man Wilson with Barry Lee Evans completing the top five. Dudgeon seemed to have the race won with a gap of 9.7 seconds at Glen Helen but Weeden clawed back three seconds by Ballaugh and by Ramsey the gap was down to 3.5 seconds. Weeden had nudged fractionally into the lead by the Bungalow, but only by a mere 0.178 which he extended to 0.8 by Cronk Ny Mona. When Dudgeon came through the finish line in a time of 118.383/ 1:16.29.453 all eyes were on the clock to see if Weeden could finish within thirty seconds and take the win and he duly crossed the line with a last lap of 121109 for an overall race time of 1:16.28.779 to win by less than a second. Ackroyd completed the top three in 117.551/ 1:17.01.944 with Wilson (116.458/ 1:17.45.308) and Moulai (16.129/ 1:17 .58.522) completing the top five. Austrian Julian Trummer was the highest placed newcomer in 13th place with 114.439/ 1:19.07.610. Tom Weeden giving it everything.